We’ve been working to protect the Greater Chaco region from rampant and largely uncontrolled drilling for over ten years. Sadly, the need for protections is only increasing. Our partners organized a rally of over 200 people to protest the latest lease sale in the region. We submitted our own official protests and support their effort to raise awareness and action against such irresponsible approval of these sales without adequate tribal consultations or analysis of impacts. To our surprise, the BLM pulled the leases within Greater Chaco from the lease sale. We’re working to better understand why, but believe that it was probably again due to lack of tribal consultation. We’ll keep working with our partners to make sure Greater Chaco enjoys the protections it deserves. This is one of those campaigns that will take many years and loads of persistence. We’ve got both. You can see the full press release below. Santa Fe, N.M. — Over 200 clean air and water advocates rallied in front of the Bureau of Land Management (BLM) state office in Santa Fe today to protest the December 5th and 6th online auction of over 89,000 acres of public and ancestral tribal lands, including over 44,000 acres in the Greater Chaco region, and over 40,000 near Carlsbad Caverns National Park. Tribal leaders, environmental groups, and advocates expressed growing outrage at BLM’s chronic disengagement with the public, its lack of meaningful tribal consultation, and its failure to consider the public health and environmental impacts of selling off federal and tribal lands for fracking. Despite receiving a record-breaking 10,000 protest comments, the BLM is moving forward with the controversial leases based on outdated Resource Management Plans (RMPs) for the Farmington, Rio Puerco, Carlsbad, and Roswell Field Offices, all of which were written before new fracking methods were feasible and without meaningful tribal consultation or consent from Navajo Nation and Pueblos who consider the Greater Chaco region sacred. Although BLM state headquarters were shuttered today due to a federal day of mourning for former President George H. W. Bush, Greater Chaco advocates proceeded with their planned rally to remind agency officials of their promise to Tribes and the American public to develop a new plan to protect Greater Chaco. Advocates wrote personalized messages to the BLM on a large banner that read “Not Your Sacrifice Zone: We Demand Justice”, and taped the banner to the front wall of BLM headquarters. “Sacrifice Zone” is a label that has stuck to the Four Corners region since the early 1970s, when the Nixon Administration began prioritizing energy extraction policies, at great cost to the communities, land, and water in the Southwest. 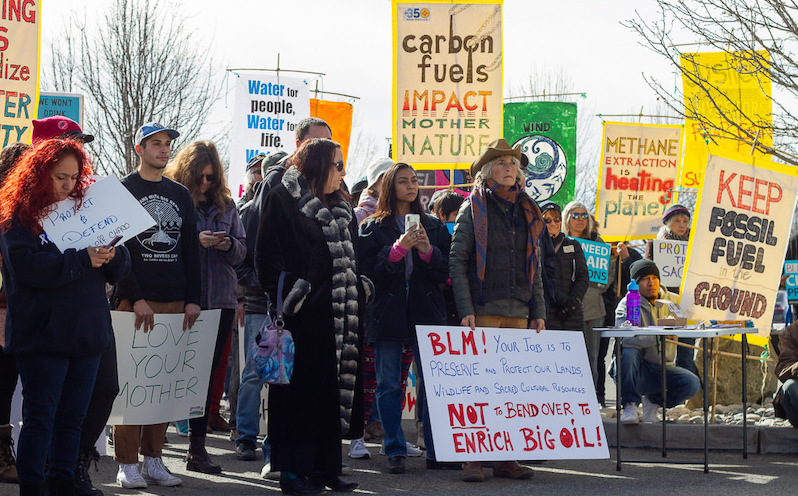 With their banner, advocates refused for New Mexico to remain a national energy sacrifice zone, and demanded instead that the BLM engage in meaningful tribal and public consultation, and ensure protections for the environment and public health. Earlier this year, Interior Secretary Zinke deferred the March lease sale of 4,434 acres calling for more cultural consultation admitting the Greater Chaco region needs more cultural study. To date, the BLM has yet to survey over 5,400 cultural resources in the region. Instead, the BLM has rolled back opportunities for the public to weigh in on oil and gas leasing, shortening “protest” or appeal periods from 30 days to just 10 days and refusing to hold any public hearings, even near impacted communities. Advocate groups currently have a lawsuit asserting that drilling without a plan is illegal. The Navajo Nation and All Pueblo Council of Governors, National Congress of American Indians, 15 Navajo Chapter Houses, the New Mexico Legislature, more than 100 organizations, and over 400,000 public citizens in total have requested a moratorium on drilling until the BLM updates its Resource Management Plans. The vast majority of public lands in the San Juan Basin of Greater Chaco and in the Permian Basin around Greater Carlsbad Caverns are already leased for oil and gas development, and residents nearby have been dealing with the impacts of resource extraction for decades. Today’s rally sends the message to officials that advocates refuse to relent until justice is upheld. A map of the oil and gas leases is available here. “Diné CARE supports the Tri-Chapter Navajo Communities of Counselors, Ojo Encino and Torreon/Star Lake position that the December 2018 lease sale completely disregards their public health and safe clean water issues. This lease sale is being held without any real consultation with the local Navajo governments and how these lease sales make the Tri-Chapter Communities a sacrifice area for the continued prosperity of the State of New Mexico and the United States. Time and time again, local leaders have demanded some “meaningful consultation,” but this lease sale shows that the energy colonization by the United States only continues”. “Our only source of water lies beneath our earth and our health is bound to the health of our environment. It is time for the BLM to listen to the will of the People and oppose any new lease sales, establish protection of the greater Chaco landscape, and preserve what pristine lands remain for future generations. Fracking is violence and we must end this rampant assault as caregivers of our only home”. “With the BLM allowing the land lease sale to commence today, they are ignoring requests, by over 100 organizations, over ten thousand public comments, dozens of Tribes, Navajo Chapters and the All Pueblo Council of Governors, for a moratorium on further oil and gas exploration and development until an adequate Resource Management Plan assessment can be completed. In this statewide land lease sale, the BLM is showing no concern for the health, safety and welfare of the affected citizens throughout New Mexico, particularly the next seven generations. In addition, no meaningful Tribal consultations have been conducted, where Federal agencies, in accordance to Presidential Executive Order 13175 and the State of New Mexico Tribal Collaboration Act, must consult with Indian Tribes and respect Tribal sovereignty as they develop policy on issues that impact Indian communities, whose concerns be addressed with free, prior and informed consent”. “From Chaco to Carlsbad, our communities, our land and our water supply are being ravaged by fracking, equating to profits over people and profits over the planet. The environmental injustices that these communities are suffering at the hands of the federal government and the oil & gas industry are appalling and unforgivable. Severe drought conditions in NM are ever present and we, New Mexicans cannot allow for the possibility of one drop of our precious water supply to be poisoned by fracking or to be used in the extraction of fossil fuels. The IPCC report and the Fourth National Climate Assessment are extremely clear. We have 12 years to drastically cut our carbon emissions but by acting now we can still avoid the most serious and dangerous impacts. Climate change is not a partisan issue, it is a human issue. We must act now and keep every drop of oil and gas in the ground or we will suffer the consequences”. “As co-founders for both Our Revolution New Mexico and Frack Free Four Corners, we emphatically protest the sales of the identified land parcels through the Bureau of Land Management (BLM). Despite the receipt of over 10,000 voices of opposition to these land sales, the BLM is forging ahead as a business facilitator for the ‘extractive industries’ with little recognition of indigenous and tribal community advice or consent. Equally bad, we are a water poor state and the extractive industries seem determined to destroy our precious water sources along with the Trump administration. They further propose to use our state as ground zero for the reintroduction and re-use of their waste water into agricultural uses and other means. These plans leave the vulnerable, poor and unconnected at risk for everything bad. We believe that these sales are dangerous to the health of New Mexico, but we also believe that this is Environmental Destruction & Racism.”.